Captain William Bligh was an unpopular man, and his behavior led his crew to undertake drastic measures. 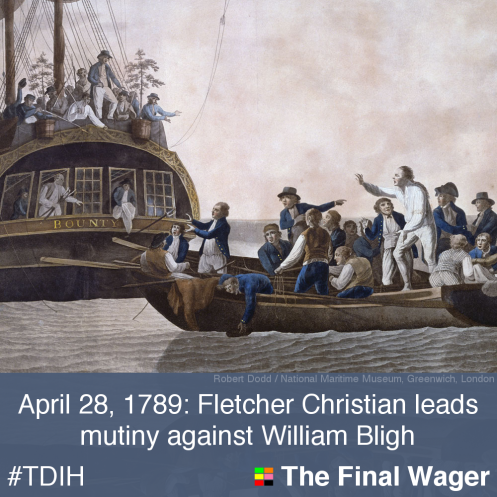 On this day in 1789, Captain Bligh’s second-in-command, Christian Fletcher, led a mutiny on the H.M.S. Bounty. But the story hardly ends there. The Bounty had been tasked with transplanting breadfruit trees from Tahiti to the British West Indies. The trip to Tahiti took a full year; Bligh had to reroute around Africa when the winds at Cape Horn proved unfavorable. Along the way, Bligh’s hot temper became evident. He routinely castigated the crew, particularly Fletcher Christian, a personal friend whom he had promoted to his acting lieutenant en route. After six months on Tahiti, where the crew loaded over 1,000 trees onto the ship, the Bounty began her homeward journey – and Bligh’s mistreatment of his subordinates became even worse. Christian, with a number of his mates, led a revolt, forcing Bligh and 18 loyalists into a boat with some rations and a few rudimentary navigational tools. In an incredible feat of endurance, Bligh navigated the boat more than 3,000 miles over 41 days to the nearest friendly settlement – a Dutch outpost on Timor. He did much of the navigating from memory, and lost only one man – who had been captured and stoned to death by Tongans early in the voyage. Upon Bligh’s return to England, a ship went out to capture the mutineers. The crew of the H.M.S. Pandora found 14 of them on Tahiti, but were unaware that nine others – including Christian – had found refuge on Pitcairn Island, 1,400 miles to the east. The descendants of these men and their Tahitian captives populate the island to this day. Great writeup! And I believe this subject is one of the most popular for Jeopardy! and for Final in particular. It seems to recur once every few years in some form or another. Mostly lost to history is a great trilogy of books by Charles Nordhoff and James Norman Hall. “Mutiny on the Bounty”, covering the eponymous events, was published in 1932. In “Men Against the Sea”, published in 1934, Bligh goes from villain to hero in what is still one of the most spectacular feats of seamanship ever achieved. It covers the voyage by Bligh and a few other crew members across over three thousand miles of the Pacific Ocean in an open boat that carried few supplies. The entire voyage took place without making landfall at any point before they reached their destination. The final book, “Pitcairn’s Island” covering the part of the crew that Mutinied, was also published in 1934. The books were once wildly popular. Now they are obscure to the point that they have gone out of copyright and you can read the full texts of each for free at Project Gutenberg.